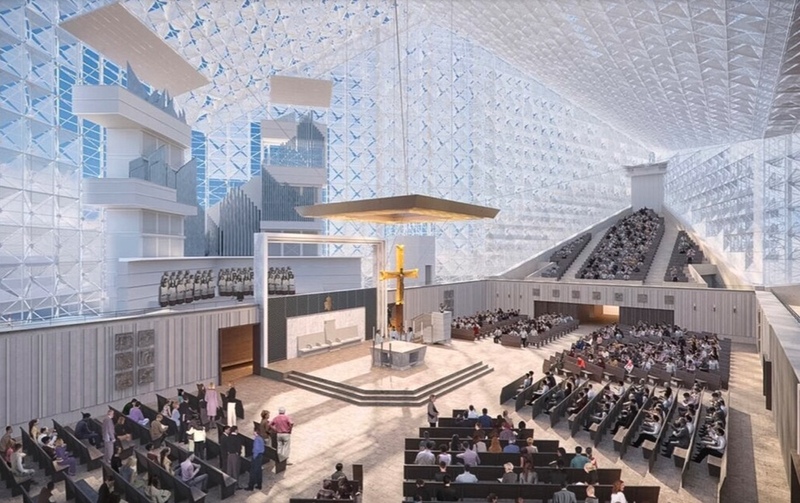 Over the decade ending next spring, the Stateside church will have opened four new cathedrals. The sign of the times, however, lies in the specifics – all but one have been built to serve Catholicism's epic emergence in the heart of the American South. Though the cycle doesn't wrap up until early 2018, yesterday saw the dedication of the largest of the group: Raleigh's 2,000-seat, $46 million Cathedral of the Holy Name of Jesus – the new hub for a 550,000-member fold not only doubled in size over the last decade, but tripled since 1990 on the back of massive migration both from the Rust Belt and Latin America. Built on a century-old property initially acquired by Maryknoll missionaries, while local officials have aimed to compare Holy Name's size to St Patrick's in New York and the Stateside fold's other storied outposts, another stat is more telling: with its launch, Raleigh is now home to the largest mother church of an American see that isn't an archdiocese. As Catholics barely comprised a single percent of North Carolina's population until the last quarter-century, the milestone further consolidates the faithful's historic ascent in the Tar Heel State, which has likewise birthed what's said to be the nation's largest parish – the 10,000-family behemoth at St Matthew's in suburban Charlotte. Marked in turns by reverence and exuberance, yesterday's rites capped an unusually emotional year for the project's builder, who fittingly – and gratefully – returned to do the honors with relish. Upon learning of his transfer to Arlington last fall as nearly a decade of planning, fundraising and construction neared the finish line, Bishop Michael Burbidge understandably wept. And on coming back to see his vision brought fully to life – delivering it on-time, on-budget and without any enduring debt – as he said early yesterday, "My knees buckled." In the end, however, the moment was nonetheless bound to be fleeting. 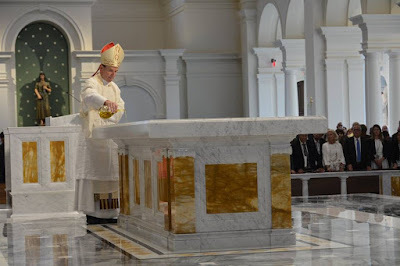 Handed the keys to the building by the construction team as the first of multiple ovations thundered through the space, Burbidge promptly passed them to his successor, Bishop Luis Zarama, who takes possession of the cathedral and its marble and gilt throne as his own in late August. And if that poetic moment – the handover from a Northeast-born Anglo to a Hispanic immigrant in the church's "New South" – doesn't sum up the reality of this era in the nation's Catholic history, then nothing ever could. In the short term, the final lap of the US' new cathedral crop comes early next year – of course, again in the South. Amid the church's exponential growth in East Tennessee, Knoxville's $28 million, 1,500-seat replacement for Sacred Heart Cathedral will be opened on March 3rd, overflowing with frescoes and capped by a Florentine-style dome. That said, what's arguably the Stateside fold's most prominent and intensely-watched project of the kind is now formally underway out West: within the last six weeks, construction finally began for the conversion of Orange County's landmark Crystal Cathedral into the seat of its 1.3 million-member diocese, with completion currently eyed for sometime in mid-2019. 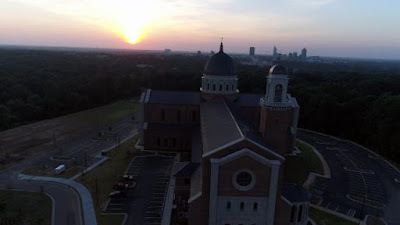 Five years since the 34-acre campus made famous by Dr Robert Schuller's "Hour of Power" was purchased for a song by the growing Orange church, the work on its centerpiece belies the reality that the rest of the site's half-dozen buildings have already been put to ecclesial use, with the diocesan Chancery, a school, several media entities and more already based there at full tilt. 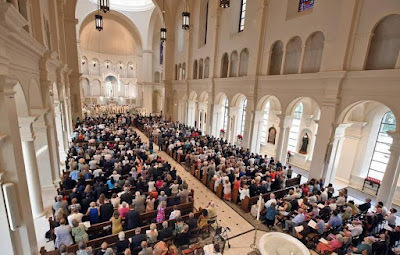 Liturgically, meanwhile, the campus' first worship space – the 1960s-era Arboretum – is serving as the de facto Cathedral church for the time being, hosting most of the diocese's major events and drawing over 12,000 people every weekend across 14 Masses in four languages: English, Spanish, Vietnamese and Chinese.